Since publication of Hetzel's The Monetary Policy of the Federal Reserve (Cambridge University Press, 2008), the intellectual consensus that had characterized macroeconomics has disappeared. That consensus emphasized efficient markets, rational expectations and the efficacy of the price system in assuring macroeconomic stability. The 2008-9 recession not only destroyed the professional consensus about the kinds of models required to understand cyclical fluctuations but also revived the credit-cycle or asset-bubble explanations of recession that dominated thinking in the nineteenth century and the first half of the twentieth century. These 'market-disorder' views emphasize excessive risk taking in financial markets and the need for government regulation. 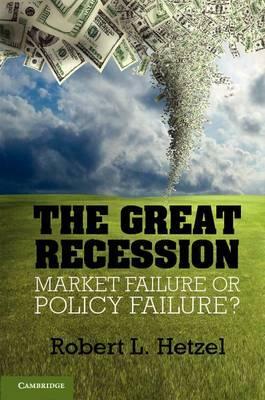 The present book argues for the alternative 'monetary-disorder' view of recessions. A review of cyclical instability over the last two centuries places the 2008-9 recession in the monetary-disorder tradition, which focuses on the monetary instability created by central banks rather than on a boom-bust cycle in financial markets. Preface; 1. The 2008-9 recession: market or policymaker failure? ; 2. Recessions: financial instability or monetary mismanagement? ; 3. The great contraction: 1929-33; 4. Monetary policy and bank runs in the great contraction; 5. Vigorous recovery and relapse: 1933-9; 6. Inter-war international monetary experiments; 7. Identifying the shocks that cause recessions; 8. From stop-go to the great moderation; 9. Controlling bank risk taking: market or regulator discipline? ; 10. The housing crash: subsidizing housing and bank risk taking; 11. Bubble trouble: easy money in 2003 and 2004? ; 12. What caused the great recession of 2008-9? ; 13. What caused the great leverage collapse? ; 14. The distinctions between credit, monetary, and liquidity policy; 15. Fed market interventions: the experiment with credit policy; 16. Evaluating policy: what are the relevant counterfactuals? ; 17. The business cycle: inherent instability or monetary instability? ; 18. Why is learning so hard? ; 19. How should society regulate capitalism: rules vs. discretion? Robert L. Hetzel is Senior Economist and Policy Adviser in the Research Department of the Federal Reserve Bank of Richmond, where he participates in debates over monetary policy and prepares the Bank's president for meetings of the Federal Open Market Committee. Dr Hetzel's research on monetary policy and the history of central banking has appeared in publications such as the Journal of Money, Credit, and Banking; the Journal of Monetary Economics; the Monetary and Economics Studies series of the Bank of Japan; and the Carnegie-Rochester Conference Series. His writings provided one of the catalysts for the congressional hearings and treasury studies that led to the issuance of Treasury Inflation Protected Securities (TIPS). Dr Hetzel has given seminars or served as a visiting scholar at the Austrian National Bank, the Bank of England, the Bank of Japan, the Bundesbank, the European Central Bank, the National Bank of Hungary and the Center for Research into European Integration in Bonn, Germany. He received his PhD in 1975 from the University of Chicago, where Nobel Laureate Milton Friedman chaired his dissertation committee. Dr Hetzel is author of The Monetary Policy of the Federal Reserve: A History (Cambridge University Press, 2008).